Suhail Malik, Andrea Phillips, Charles Esche, Matthew Poole, Saskia Sassen, PILOT 3, organized by Matthew Poole. Paper presented as part of the preview for the third edition of PILOT: during the opening week of the Venice Biennale,Think with the Senses, Feel with the Mind, 2007 curated by Robert Storr in collaboration with PoCA, the Political Currency of Art research group. With Suhail Malik, Andrea Phillips, Charles Esche, Matthew Poole and Saskia Sassen. This paper was later presented as part of a series of talks at The Serpentine Gallery, London, 2007. 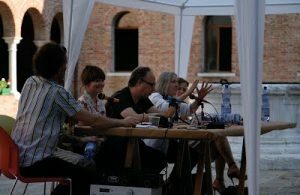 The discussion focussed on the historical trajectory of the Venice Biennale and its changing role within the shifting socio-political context of the city, as well as looking to issues within the art world in general regarding the role of art fairs and biennials within economic systems and the agents of globalization.